How does router perform IP Lookup? Router confirms routing table before forwarding of any packet to any destination. If route exists in the routing database, packet forwarding will happen otherwise packet gets dropped. Let assume destination address or prefix is available in the routing table but how does router search the prefix from the routing table. Does router search in the form of binary, hex decimal, octal or decimal? Obviously, router understands digital which means only binary (zeros and ones). 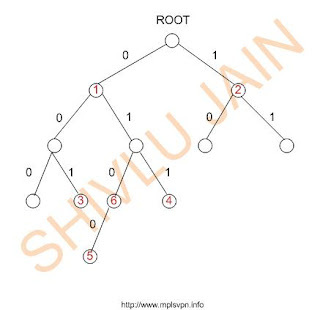 Route prefixes are stored in the form of TRIE which means a binary ordered tree which is used to store an array. Let’s see how router stores the given prefixes in the routing table. To make it short I am assuming that prefix length is not more than 4 bits. The above 4 bit prefixes will store in the router as depicted in the diagram. In diagram, red color circled numbers are showing the prefix serial number like prefix 5 is 0100. 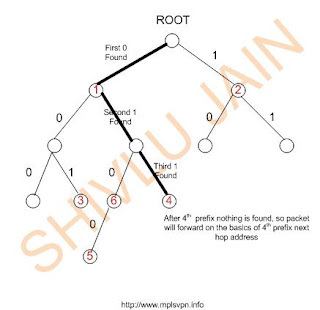 Now how the router will search the destination prefix 0110 which is not present in the routing table but the search will be based on the longest prefix match. So router will search first 0, second 1 and third 1 but after third search it will not find anything. So prefix number 4 will be the longest prefix match and traffic forwarding will happen on next hop of prefix 4. The above shown binary tree is also known as TRIE. The programming of this TRIE is done in with the help of data structure. Since morning, I am facing a weird issue about opening of sites in chrome explorer. If I perform any of the new search in google, I get the results but after clicking on the any of the webpage, chrome shows that "Oops! Google Chrome could not find go.webmynd.com". But at the same time internet explorer is working fine. I am thinking that google has signed up webmynd.com. Here is the running junos 7.4 in Qemu. download the files extract to one folder. and follow these steps. 1. Install TAP interface buy installing open vpn software. Loggin details of Running Junos. After JUNOS installation on QEMU, now the next step is to integrate JUNOS with GNS3. This is only possible by adding cloud in the GNS; add the TAP1 interface in cloud and connect that interface with cisco router. Image 3:- Connect TAP1 interface of cloud with Cisco GNS3 router. This post is fully dedicated to CCNA beginners who want to learn but don't want to install GNS3. This is the online practice lab where students can access the online simulator and practice for their CCNA labs. We normally use wireshark to analyse pcap files. Today, I found a good web tool which would help you to analyse your pcap traces online. Now you don't need to install wireshark on your laptop or personal computer. Use online version of cloud shark. It is always said that if single vlan wants to communicate with another vlan, inter vlan routing is required. But in the depicted scenario, vlan 10 is able to communicate with vlan 20 without any layer 3 device. The logic behind the working is very simple and it is totally based on tagged and untagged concept. Access ports always tagged the incoming traffic with vlan configured on port and make untagged the outgoing traffic. The same is happening in the given scenario, when the traffic is being forwarded by PC-1 and Switch A access port receives the traffic, mark that traffic with vlan 10 and look forwards for the vlan 10 ports. After that Switch A another port which is part of vlan 10 receives the traffic and forward it towards Switch B. During forwarding Switch A port untagged that vlan and forwards the traffic without any vlan tag. Switch B port receives the incoming traffic and tagged it with vlan 20 and forwards the traffic towards PC-2. This way end to end communication takes place without the use of router or any layer 3 device. So we can say inter vlan routing without any layer 3 device. 1. Download QEMU and JQEMU for Windows and add JQEMU in QEMU folder. JQEMU is required because it provides windows driver for virtual intel nic card. 2. Download Open VPN to create TAP interface. This is required because we cannot upload the JUNOS image directly to QEMU. To achieve the task we need open vpn. 3. Download Free BSD image. 4. Download JUNOS operating system. I am using Jinstall-7.4r3.4-Domestic-Signed.tgz. This could be downloaded from here. 5. Download free 3CDaemon ftp server to upload JUNOS in QEMU. 1. Put the free BSD mini ISO image in QEMU directory. 2. Run depicted command from command prompt to create OLIVE image. 3. Run depicted command to start the QEMU installation process. 4. Qemu installation window will pop up and start with the standard installation. Skip kernal configuration and go with the standard one. In the next windows, simply select option A for all and press Q. 2. 1024M which is swap partition. Make sure to follow the same steps as depicted in the images. Now press C to create first partition which is "/"
Now create the second partition which is swap. Create the third partition which is /config. Then select no for the setting ((Ethernet/SLIP config, gateway, inetd, FTP, NFS, security, console, linux compatibility, set time, etc), only configure root password. Select user and then press X. Select no for user confirmation request. Press Yes in the next window and you will find congratulations window for the installation. After this press ALT+Control+2 and type quit to come out. In the next post, I will use this installation to install JUNOS in PC. After spending 3 continuous late nights; Finally I am able to install JUNOS on my PC. The procedure is bit cumbersome but not impossible. I had faced lot of issues during installation but where there is will there is way. Now next step is to integrate with GNS3. I am preparing document for the installation process with all the snap shots. Sooner will upload it. Do you think interviewer can judge technical knowledge of candidate in short duration of interview? Few interview MPLS questions I have added in my post MPLS Interview Questions for CCNA and CCNP Engineers. In this I am adding the quick answers to all the questions. If someone knows the best than the answers, please comment it. 1. VPN is generally Virtual Private Network which could be configured by using GRE tunnels. In that if you want a full mesh than administrator need to setup n*n-1 tunnels. But in case of MPLS VPN, by default CPE works in full mesh form because of route target. 2. MPLS is multi protocol label switching mechanism which uses the label to forward the traffic to the next hop address. It is popular because it must be used for CPN (Converge Packet Network). 3. MPLS uses TDP or LDP. 4. It works between layer 2 and layer 3. 5. P router doesn’t have Customer network routes where in PE router is having customer network routes. Another reason is P router doesn’t require MP-iBGP but for PE it is must. 6. To make your PE router as P, you need to remove the BGP configurations and after that it will not participate with customer network. 8. LDP router id and BGP router-id should be same if SP is using labels only for loopbacks. If labels are generated for each and every route then no problem at all. 9. Second last router performs the Penultimate Hop Popping function to remove the top most label. 13. RD is not an extended community where as RT is an extended community. 14. RD is unique and local to router. 24. CEF is mandatory in Cisco routers for MPLS. 25. LDP is not configured in the path. 29. At another end MPLS IP is not configured. 32. Because it supports almost each and every protocol. The government has drawn up a comprehensive list of Chinese and Israeli telecom gear makers who will be temporarily barred from supplying equipment to mobile service companies in India till the new network security norms are in place. The list, which has been prepared by the Intelligence Bureau (IB), has the names of 26 companies, including top Chinese Original Equipment Manufacturers(OEMs), Lenovo, Huawei Technologies, ZTE, Sunsea Telecoms, UT Starcom, Tongyu Communications, Wuhan Fibrehome International, Shenzhen Grentech, Maipu Communications, and one Israeli telecom gear maker, Comverse. UNI Cell Format aka User Network Interface, which is directly connected to any ATM switch and responsible to send and receive atm cells. 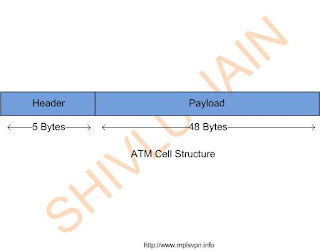 NNI Cell Format aka Network to Network Interface; the interface between any two ATM switches. ATM is based on pure circuit and packet switching technique. 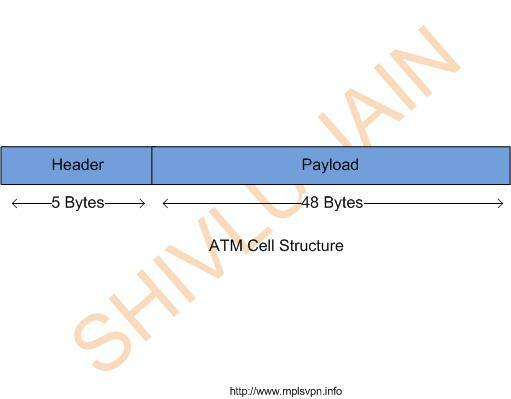 ATM connection is having VPI and VCI concept. VPI stands for Virtual Path Identifier and VCI stands for Virtual Connection Identifier. The VPI/VCI field is 24 bits long in UNI 28 bits in NNI. VPI field is 8 bits long in UNI and 12 bits long in NNI. The VCI field is 16 bits long in UNI as well as in NNI. It means we can have only 2^8=256 VPI connections in UNI and 2^12=4096 connections in NNI. Each UNI and NNI VPI is having 65536 VCI connections. VPI connections can be assigned from any number but some limitation is there for assigning VCI connections. VCI 0 – 15 are reserved by ITU-T, 16 – 31 are reserved by ATM forum and 32 to 65535 are free and could be used by users. Virtual connection is the combination of both VPI and VCI. VPI and VCI values are always local to the ATM devices and have nothing to do with the remote. Intermediate ATM switches translate the incoming and outgoing VPI and VCI values along with their ingress and egress ports. This operation is referred as label swapping.